It's not very often that a game manages to take familiar genre mechanics and reshape them into something that feels fresh and interesting, but that's exactly what developer Digital Sun has done with action RPG release Moonlighter. The studio's latest Kickstarter-based title takes the concept of inventory management and molds it into its own sort of meta-game, tasking players with displaying items, setting prices, and making sales, all in order to provide funding for dungeon exploration. It's an addictive formula, and its appeal is largely based on the fine balance between both commerce and combat. 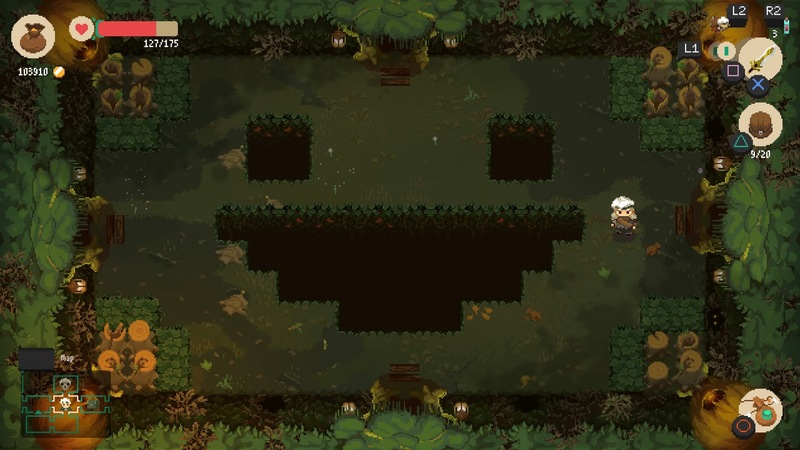 The heart of Moonlighter is based around the game's interplay of item acquisition and shop management. Players will spend almost all of their time either diving into the game's various dungeons or selling the goods they find within them, and the money procured from said transactions helps fund the weapons, armor, and potions needed to make further dungeon exploration possible. Keeping up with shop duties is fairly straightforward: players will set prices for their items, then gauge the response to the price based on four different customer reactions. Items can be sold for more than their typical value assuming demand is high and supply is low, though pushing the price too high will result in unhappy or unwilling shoppers. Likewise, players looking to sell new or unfamiliar items may set the price too low, prompting customers to excitedly purchase the item for well less than what it's actually worth. The shop known as Moonlighter in its modest early stages. Once prices are set and items are laid out across various tables, opening the shop for business starts a minigame of sorts where customers come in, browse for a bit, then take their desired items to the register for sale. Business hours run out fairly quickly, and making the most out of a business day means keeping tables stocked with items and looking out for thieves that try to sneak away with valuable goods. Once the day's commerce has completed, players can either go to sleep to start a new day or head east toward the dungeons for some nighttime spelunking. 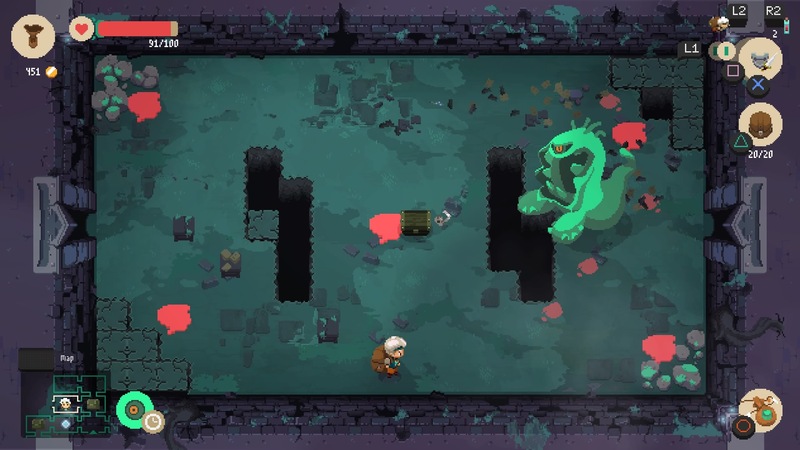 The other side of the Moonlighter formula involves diving into one of the game's five different dungeons. These procedurally generated areas are comprised of rooms with random enemies, items, and exits placed in cardinal directions. The system is similar to titles like The Binding of Isaac, where the initial rooms and levels are relatively easy and players who dive further into the dungeon will find both greater challenges and greater rewards. Making way through the dungeons involves going room-to-room, clearing out enemies using any preferred weapon type, and claiming all of the loot that monsters drop when they perish. Inventory management plays a big part in this, as the hero can only hold so many items in his bag, and taking too much damage will result in a loss of all acquired goods. Items also sometimes carry curses with different effects: some curses make the item fragile and liable to break, while others may immediately send the loot back home or even remove the curse from other objects. Despite the random nature of the dungeons, there is some method to the madness: pathways and enemies may be randomized, but players will always encounter a healing spring on the path to the next floor, and each floor will have a special room featuring a tent and notes left behind by fallen heroes. Every now and then players will encounter a passage that briefly dives into an entirely different dungeon, often making forward progress much more risky, and the third level of each dungeon contains a special boss that must be defeated in order to access the next dungeon type. The Golem King coming to terms with his imminent demise. The challenges offered by the dungeons at first seem daunting, as players will be working with limited or underpowered equipment. In the early hours, players will likely teleport out of the dungeon as soon as they've acquired enough valuables to unlock the one-way portal back to town. Before too long, the hero will be able to sell items within the dungeon (at a substantially reduced price) in order to clear up space for items of greater value. Eventually, players will be also able to spawn their own temporary two-way portal that allows them to go home, drop off goods, run the shop if desired, then return to the place in the dungeon where they left off. 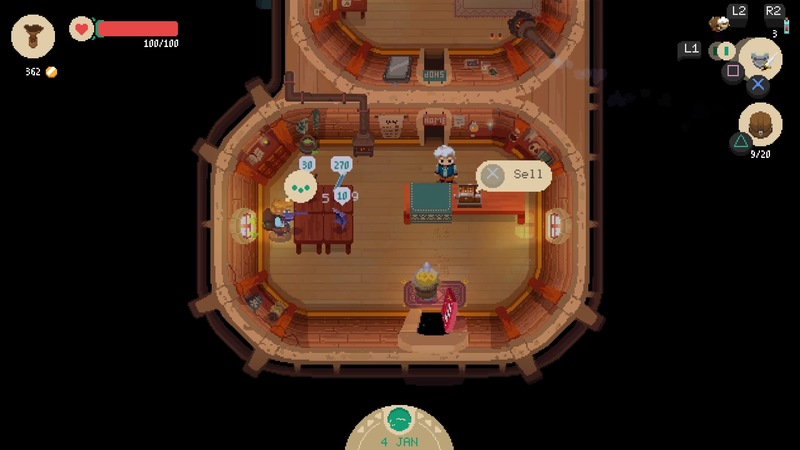 Though dungeon raiding and shopkeeping duties make up the bulk of the Moonlighter experience, they aren't all the game has to offer. The town of Rynoka is itself a home base of sorts, and aside from buying new items, the player can put gold toward town upgrades, which ultimately bring new merchants and citizens to the area. Players can also build various extensions to their shop in order to increase everything from its overall size to the number of sales tables and more. There are four different shop upgrade packages available, and each one offers up three different sub-upgrades, the likes of which offer the option to offer items at special discounts or earn gratuity from paying customers. New weapons and weapon upgrades are available through the smith Andrei. Additional town merchants also help toward this front, as they can provide new equipment for the hero, upgrades to equipment, or decorations that can provide passive bonuses to the shop, like ones that increase customer shopping speed or decrease the likelihood of pilfer-happy ne'er-do-wells. There's even the option to bring a competing merchant to town that the player can go to for items they don't feel like searching for within the dungeons. 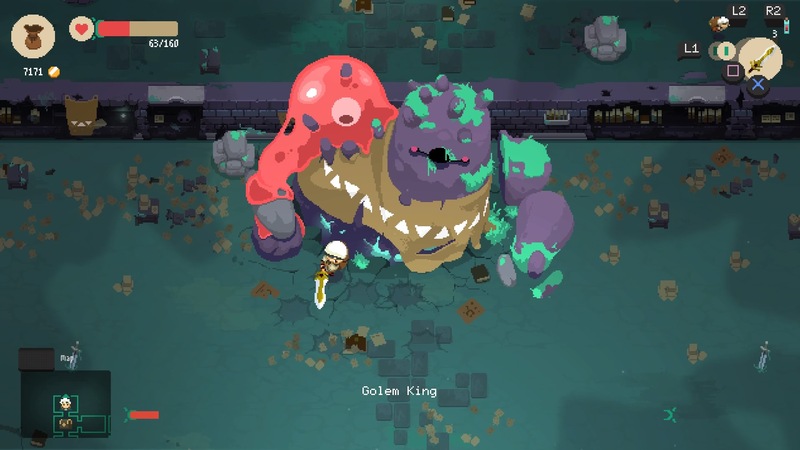 Despite the number of different mechanics in play, Moonlighter manages to feel very approachable, and its split between shopkeeping and dungeon diving makes it well-suited for both short and extended gameplay sessions. The graphical style hits all the right marks for retro-inspired titles, and the music on offer is very well-composed, providing just the right amount of old-school flavor without drawing too much attention to itself. A cleared dungeon is a happy dungeon. 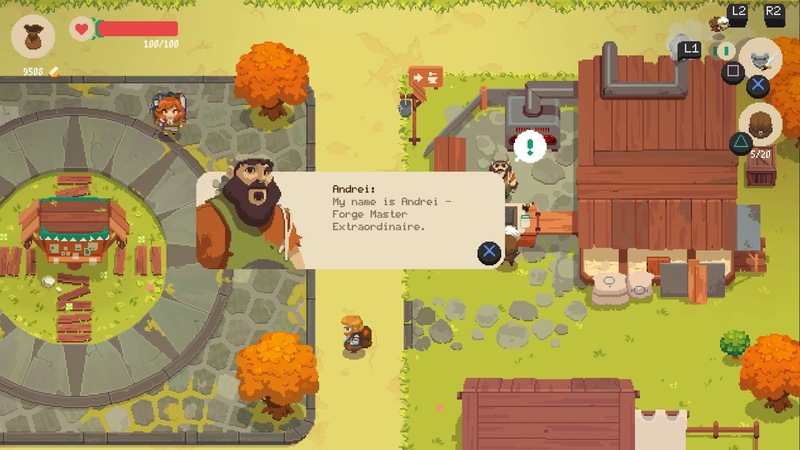 The way that Moonlighter splits gameplay between item acquisition and sales makes for a pleasingly circuitous formula. Selling out of inventory items is a great incentive to go find new goods within dungeons, and finding increasingly rare loot in dungeons provides incentive to go back to town and open up shop. The interplay between commerce and dungeon diving means there's never a moment where players feel like they aren't making some sort of progress, as success in the shop leads to success in the field and vice versa. Because of this, Moonlighter feels like one of the more immediately gratifying action RPGs on the current market. It may not do anything players haven't seen before, but the focus on earning and selling items transforms simple commerce from a banal activity into an addictive process that only gets more entertaining as the game progresses. There are a few annoying flies in the ointment — item descriptions don't always fit on screen, weapons occasionally miss enemies within range, and in-dungeon inventory management sometimes feels too time-consuming — but otherwise, the game's engaging blend of active shopkeeping and dungeon crawling should be more than enough to keep retro-styled action RPG fans smiling. This review is based on a download code provided by the publisher. Moonlighter is available in digital stores on May 29 for $19.99. The game has been rated E for Everyone 10+ by the ESRB. Deep cut. My parents used to love that damn show.